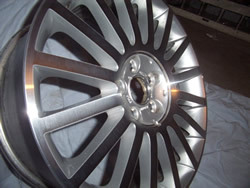 Sharrock Engineers are specialists in aluminium alloy and mag wheel machining and repair services. If you have a broken or damaged mag wheel, we can fix it. We can fix all of these conditions in our precision engineering workshop. Image is everything. Restore those weathered mags! Let's face it. Unless you're Michael Schumacher, having mag wheels on your ride is probably about the looks. If your mag wheels are weathered and no longer look the part, we can machine a thin layer off the face to restore them to their former glory -- practically as good as new for a fraction of the price. And we can now spray the "Super Silver" mag wheel finishes, as well as the more traditional silver, gold, pearl and solid coloured finishes. Custom fitment requirements? Mag wheel modification? No problem! We can machine blank mag wheels to your fitment requirements. And we can safely modify existing wheels to change the stud pattern, offset, or hub diameter.